Why it was great: My good friend Tommy Tomlinson tells it best — he was there. He says that there was a big crowd of Georgia fans at Foley Field, there to mock Bo Jackson for playing baseball. They brought out footballs, they were signaling football penalties, they were laughing at Bo. As we’ve pointed out here, you don’t mock Bo. His first time up, first pitch, Bo hit a home run that — well, even years later, Bo would say that for one only two times in his life he was so locked in he actually saw the stitches on the ball clearly enough to count them. Tommy says there is no way to describe just how hard he hit that ball. The best he could do is say that as soon as Bo hit it, there was an instant sound in the crowd that was like “OOF” — something like that sound you hear on television shows when someone gets hit in the stomach. And then there was silence. Dead silence. Crickets stopped chirping. Birds stopped singing. It was so quiet, you could hit Bo’s spikes scraping dirt. It was like the silence at the end of the movie ‘Babe.” And then, suddenly, everybody in Georgia just started cheering and bowing to the man. Bo hit two more home runs that day. Between the post and the comments, Bo’s name comes up six times in Posnanski’s list. The Georgia crowd hooted and taunted Bo Jackson as he stood in the batter’s box, looking all out of place. You have to understand that there is plenty of bad blood between the kids at Georgia and the kids at Auburn. They are not rivals, exactly – Auburn already has Alabama and/or Tennessee, Georgia already has Florida and/or Georgia Tech. But one good thing about Southern football schools – the fans have plenty of animosity to spread around, and there’s more passion in Georgia-Auburn than there is in most rivalries across America. “Wrong field, Bo!” a few Georgia fans taunted … this was the perfect time and place to get in a few shots at Bo. Nobody messed with Bo on the football field. He was a phenomenon there – he was bigger, stronger, faster than anyone. He averaged 7.7 yards per carry as a sophomore, and later, in his Heisman Trophy senior season, he once gained 100-plus yards in a game when he had two broken ribs. Georgia fans may not like Auburn any more than Auburn fans like Georgia – but both sides respect football greatness when they see it. But this was Bo on the baseball field, and that was a different thing. The fans hooted and mocked – a couple had brought footballs they waved. Bo never looked particularly at ease in the batter’s box; his batting stance was always a jangle of nerves. The first pitch, Bo swung and missed by three feet, and that taunting went up another level, laughter mixed in, poor Bo, poor misplaced Bo, what was he doing out there? 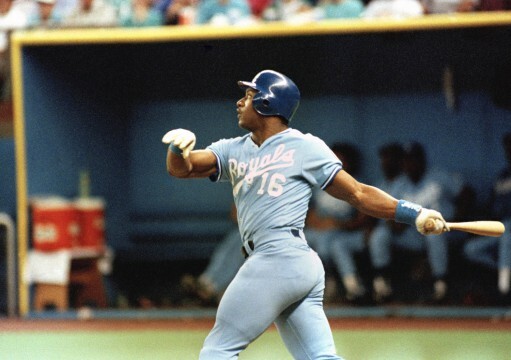 Bo Jackson hit the next pitch 550 feet. Actually, nobody knows exactly how far Bo hit it – they only know it was the longest ball ever hit at the University of Georgia. It might have been 500 feet, it might have been 4000 feet, but the distance didn’t matter. Bo Jackson hit the longest home run any of those kids had ever seen. And there was silence. Eerie, stunned, pitch silence. Bo ran around the bases in that silence. By the time he reached third base, the college had snapped out of their state of shock and they finally reacted. They started cheering and bowing to Bo Jackson. If my remembrance of Hal Baird’s telling is correct it was the first game. *I remember* Baird telling it like this: Heckled in the first at bat, home run into the lights. Heckeld in the second at bat, home run into the lights. Cheered in the third at bat, Roy Hobbsian outcome. Also, in my memory of the Baird telling, this was UGa’s first night game. But, you know what, even if I’m wrong, I still like the story this way. So it is, in fact, full of truthiness. Saw the visiting Memphis Chicks playing the B’Ham Barons at old Rickwood field. Bo hit a single and was positioned on first. A batter or two later hit a routine can of corn to right field. Bo tagged on the fly and took second base easily beating an on target throw byt he right fielder. Fastest I have EVER seen anyone move from first to second. The ONLY time I have ever seen a runner tag an advance on a simple fly to right. The stadium went into a stunned silence. I’m a UGA grad who was a student when Bo was attending Auburn and was actually at the UGA-AU baseball game mentioned above. It was the first night game in UGA baseball history – the lights were newly installed and Bo out on the most impressive hitting display I’ve ever witnessed. His first HR reminded me of the Natural scene because it hit the top of the light pole in dead center field and was still rising when it struck the lights and bounced back into the outfield! I remember him hitting 3 home runs and double plus we walked him once and he scored from first base on a single to left field. I remember the last home run was very entertaining because we had a bunch of fans sitting on Kadzu hill just beyond the right field wall who had been heckling him all game long. You could see him turn his hips and intentionally direct the ball towards them and send everyone scattering – LOL. After the game, I told people that if Bo played football over baseball, he was crazy because the guy was an amazing baseball player. I’ve witnessed some amazing UGA sports moments, but that night game at Foley Field ranks in my top 5! I was there sitting on a cooler outside the field down the 3rd baseline. In his first at bat, we heckled Bo with ” Shake it Bo, shake it” as he stood in the batter’s box and shook his rear end as he prepared for the pitch. He grounded a routine ball to the second baseman who threw him out by barely an eyelash because he was incredibly fast down the line. In his second at bat, as he stepped in, we heckled again, “Shake it like you did last time Bo”. A pitch or two later, as we continued to berate him fueled by knothole beer, he stroked a drive that resembled a backspin rising golf shot that was still climbing as it hit the brand new lights at the top of the centerfield standard. Stunned silence, then cheers from everyone including us knotholers. Sportwriters the next day called it “the hardest hit ball ” they had ever seen. I left a Bo fan even though I did and do despise Auburn.